As interest in near field communication grows around the globe, so does the interest from transit agencies. The Bay Area Rapid Transit (BART) in San Francisco is an early adopter, examining the technology to see how it works in a transit environment. BART serves 370,000 riders daily or about 100 million riders a year, says Fang. The average commute is 10 miles along BART’s 97 miles of rail. The 35-year-old agency serves three counties in the bay area – San Francisco, Alameda and Contra Costa-and is operated by an elected nine-member board consisting of three members from each of the three counties. In January, 230 BART riders were given a Sprint-provided, NFC-compatible phone to use as the method of payment when riding the rails. The same phone could also be used to make purchases at Jack-in-the-Box restaurants or at any merchant capable of accepting contactless payment cards, such as those offered by MasterCard, Visa and American Express. The NFC trial participants were chosen from a pool of BART’s EZ Rider users. The EZ Rider card is contactless, which meant the learning curve would not be as great, says Dave Holmes, NFC business development manager for NXP, the company that developed the technology in 2002 along with Sony. It still is, but that didn’t stop BART from exploring it further. “You’ve got to give so much respect to the staff and Sprint. They came forward and said it was a great idea. They just accelerated the process, and I was surprised at how fast it came about,” says Fang. 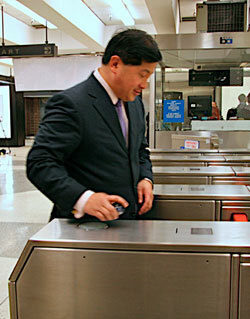 James Fang, a member of BART’s board of directors pays for a ride with the new service. Using a phone for payments seems like a logical progression, Fang says. “There are about 280 million people in the U.S., according to one report I saw but there are 320 million cell phones in use. 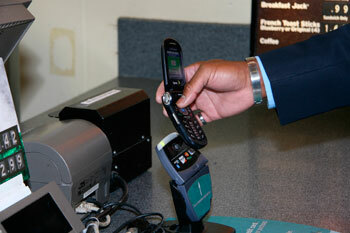 One of the things that’s very striking is that everyone has a phone.” That’s why NFC use seems to be a no-brainer. Another advantage is that NFC payments would avoid paper tickets getting jammed in the readers, which can cause lines at the turnstiles. “This is a big step towards eliminating that problem,” adds Fang. First Data Corp manages the service. “On the BART side, it’s being managed with BART’s back-end system in conjunction with Speedpay, a bill payment site from Western Union,” says Holmes. Users can go online to tie a BART card that’s on the phone to a credit card. Each test rider initially had $48 downloaded onto his or her phone through Sprint and payable by the customer’s credit card. When the total dips to “$10 or $15, the phone is automatically reloaded,” says Fang. Reloading, when needed, can also take place when the person uses his phone, adds Holmes. “I know you can top it off at the cash register because if I need to add $20 to my Jack card, I simply touch my phone to the point-of-sales terminal,” Holmes says. Another advantage that was implemented in the BART pilot is that riders can tap their phones against certain posters and get a list of all the locations of Jack-in-the-Box locations near that particular station, says Fang. BART originally allocated $350,000 for the BART pilot, but because of contributions, says Fang, the agency has only spent $250,000 to implement the trial. 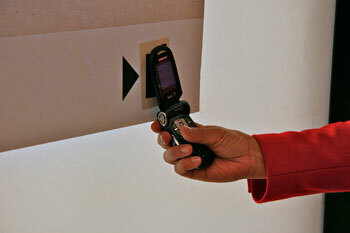 Better security is another advantage for the pre-loaded NFC phones. “If you lose your card, you’re out of luck because there is no security. But with a phone, you can put in a security code and if you lose the phone, you can call the phone company to suspend use of that phone,” says Fang. After the trial ends, “My guess is that Sprint will make these phones available on a wide basis for anyone who wants them,” adds Fang. Sprint was not available to comment on the pilot. Fang says other mobile operators have made inquiries about offering something similar. Because the technology is still new, NXP’s Holmes says he’s received “lots of reaction when I touch my phone instead of a card to the terminal. It’s usually the first time the clerk has seen someone pay with a phone and I get wildly positive remarks, including people calling their coworkers out of the back and making me buy another item just so they can see it in action,” Holmes says. He says NXP and the other involved companies are still gathering information – including surveys and focus groups-regarding the trial. “It wraps up in May and the findings will be aggregated and put together. Whether the results become public or not will be up to the companies involved,” says Holmes. “NXP is pretty optimistic and that we expect to see some commercial roll outs in 2008 and multiple roll outs in 2009,” adds Holmes, though he declined to provide specifics.